Pictures of rare antique chimneypieces and fire grates ranging in date from the 1600s to the 19th century. 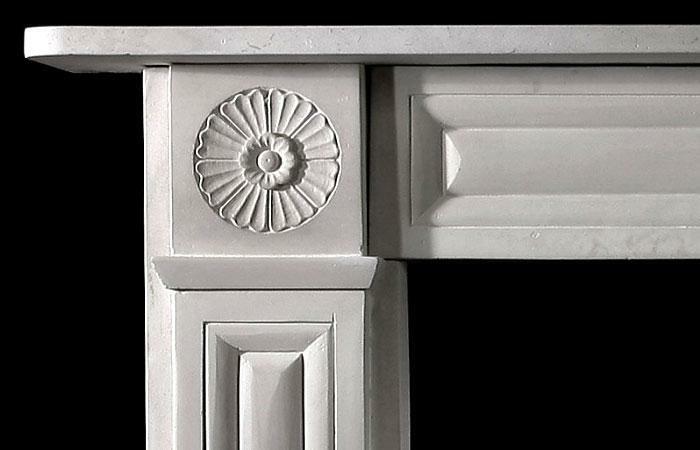 An unusual Arts and Crafts Portland stone antique mantel, c.1890, with heavily stylized Palms to the jambs surmounted by a finely carved group of three Peacocks. 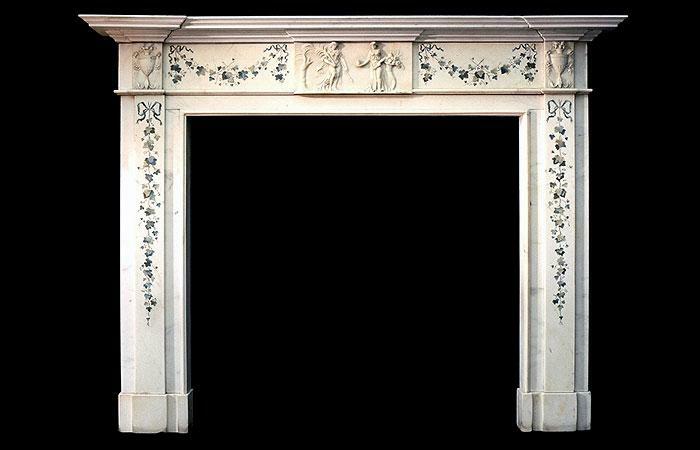 An Irish George III scagliola inlaid cararra marble chimneypiece circa 1780, in the manner of Pietro Bossi. 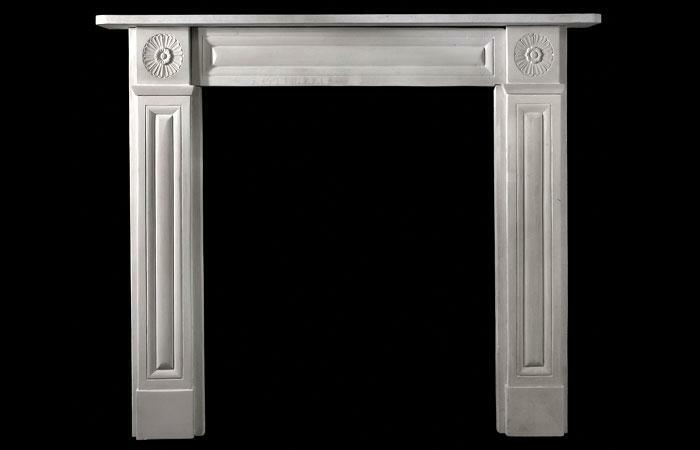 Sotheby’s held a sale dedicated entirely to antique chimneypieces and fire grates. The sale – among the first of its kind at a leading auction house – will bring to the market some 200 rare, important and unusual pieces, ranging in date from the 1600s to the 19th century, and emanating from all corners of Europe. 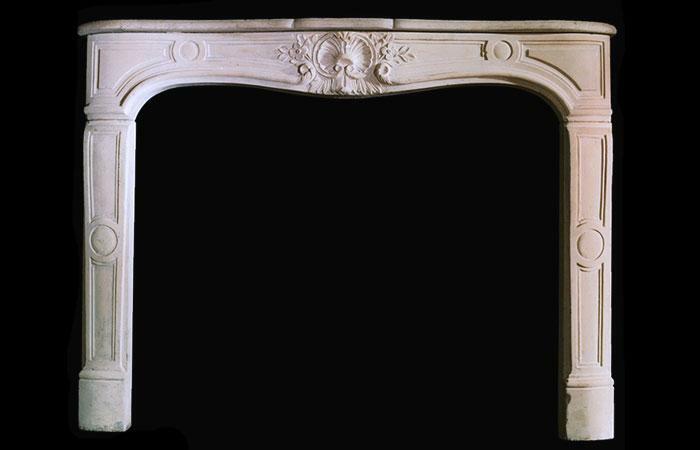 Amassed with a discerning eye over a period of some 25 years by Paul Chesney, founder of the leading eponymous fireplace suppliers, the pieces to be sold represent almost the entire antique stock of the company. 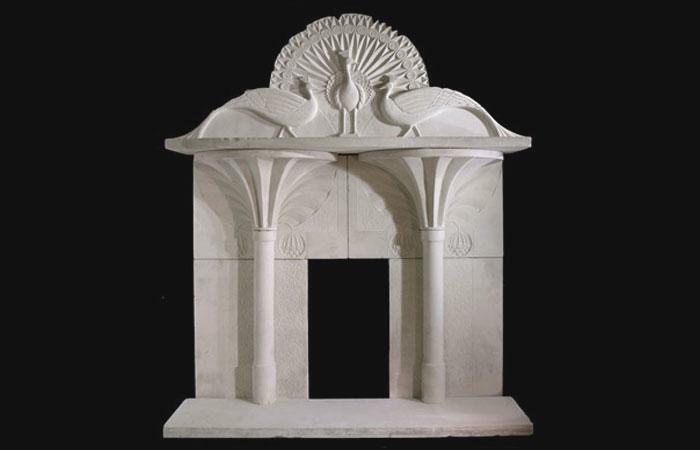 With the business now focusing on its increasingly international operation of producing and supplying fine reproduction fireplaces, the company’s antique stock is to be released onto the market in a vast sale that will occupy almost all of Sotheby’s New Bond Street gallery space. 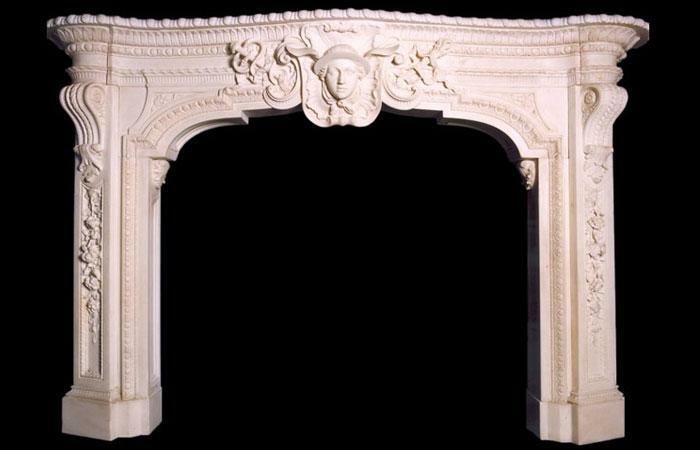 While the sale as a whole will allow for an overview of chimneypiece design over the course of some 300 years, many of the individual pieces to be offered have interesting stories to tell: some are pieces of great architectural importance; some demonstrate the extraordinary craftsmanship of names such as Robert Adam; some are quirky and unusual; and all are fine examples of their period. Founded by brothers Paul and Nick Chesney 25 years ago, this top-ranking company has come a long way since its chance beginnings. Having read law at Cambridge, and having subsequently qualified and practiced as a lawyer, Paul Chesney realized that the law was not the career he wanted, so he took on work as a painter and decorator while deciding what to do next. It was then, while working on a job in North London in 1985, that he noticed a Victorian chimneypiece lying in a skip. He took it home, thinking it would add character to the flat he was renting. In the end, it was too large for the space, but Paul’s interest had been sparked; he downed brushes and set about seeking out the best possible examples of old fireplaces he could find and afford. Now, some 25 years later, his company owns the largest and finest collection of antique chimneypieces known to exist. This extraordinary example of the best in fireplace design and execution was, for over half-century, believed to be lost. The crisp, fluently carved piece was once the centerpiece of the Saloon, or “Green Damask Room”, in one of London’s most celebrated “private palaces”: Norfolk House. This splendid palace, the interiors of which were “infinitely superior to anything in this Kingdom… and to most things… in Europe” (Capt. William Farrington, 1748) was built between 1748 and 1752 on the site of an earlier house (also Norfolk House). While each of the rooms was decorated in a slightly different manner, it was – thanks to the influence of the incurable Francophile Mary, 9th Duchess of Norfolk – the rococo style that dominated. But even the wildest dreams of the indomitable Duchess (or “My Lord Duchess”, as Horace Walpole referred to her) could not have been made real without the creative genius of Italian architect Giovanni Battista Borra (1713-1770), who was responsible for almost every decorative detail inside the house, from the grimacing monkeys above the doorcases in the ballroom, to the rococo extravagance of the Music Room (“the most fluent expression of the rococo to be found in England”, now fully recreated in the Victoria & Albert Museum in London), to the fireplace that, long considered to be lost, now forms the centerpiece of September’s sale. Prior to the demolition, the contents of the house, the chimneypiece among them, were removed; they were sold at auction later that year, where after all trace of them was, for the most part, lost. 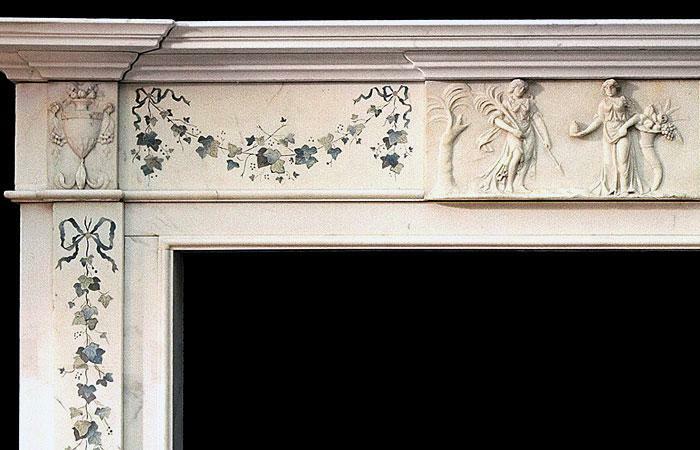 Such was the fate of the chimneypiece until, some 12 years ago; Paul Chesney came across the central frieze. He knew nothing, at the time, of its history, but the carving was so crisp and assured, and the head of Mercury so distinctive, he felt he had to buy it, as an objet d’art if nothing else. He kept it, often admiring its craftsmanship and wondering about the kind of home it must once have graced, until in autumn 2000, thumbing through a copy of Country Life he came across full-page black & white image of a beautiful room, in the centre of which was his frieze. The room depicted was the Saloon at Norfolk House; the other elements of the chimneypiece (the jambs with corbels and trailing foliage) were clearly visible, and so the hunt for those began. 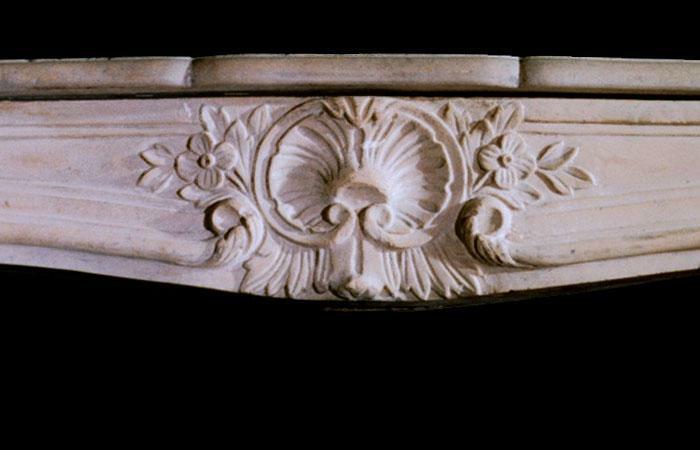 It ended in 2005, when the jambs appeared at sale in the West Country, and soon after, the various elements of this extraordinary chimneypiece were once again reunited.